This product contains chemicals including, Trilostane, which is known to the State of California to cause cancer, birth defects or other reproductive harm. (California law requires this warning to be given to customers in the state of California) For more information go to www.P65Warnings.ca.gov. Always provide the Client Information Sheet with prescription. The starting dose for the treatment of hyperadrenocorticism in dogs is 1.0-3.0 mg/lb (2.2-6.7 mg/kg) once a day based on body weight and capsule size (see Table 1). VETORYL Capsules should be administered with food. After approximately 10-14 days at this dose, re-examine the dog and conduct a 4-6 hour post-dosing ACTH stimulation test. If physical examination is acceptable, take action according to Table 2. *Combinations of capsule sizes should be used to slowly increase the once daily dose. Individual dose adjustments and close monitoring are essential. Re-examine and conduct an ACTH stimulation test 10-14 days after every dose alteration. Care must be taken during dose increases to monitor the dog's clinical signs and serum electrolyte concentrations. Once daily administration is recommended. However, if clinical signs are not controlled for the full day, twice daily dosing may be needed. To switch from once daily to twice daily dosing, increase the total daily dose by 1/3 to 1/2 and divide the total amount into two doses given 12 hours apart. Once an optimum dose of VETORYL Capsules has been reached, re-examine the dog at 30 days, 90 days and every 3 months thereafter. At a minimum, this monitoring should include a thorough history and physical examination, ACTH stimulation test (conducted 4-6 hours after VETORYL Capsule administration), and serum biochemical tests (with particular attention to electrolytes, renal and hepatic function). A post-ACTH stimulation test resulting in a cortisol of 1.45 µg/dL (40 nmol/L), with or without electrolyte abnormalities, may precede the development of clinical signs of hypoadrenocorticism. Good control is indicated by favorable clinical signs as well as post-ACTH serum cortisol of 1.45-9.1 µg/dL (40-250 nmol/L). If the ACTH stimulation test is 1.45 µg/dL (40 nmol/L) and/or if electrolyte imbalances characteristic of hypoadrenocorticism (hyperkalemia and hyponatremia) are found, VETORYL Capsules should be temporarily discontinued until recurrence of clinical signs consistent with hyperadrenocorticism and test results return to normal (1.45-9.1 µg/dL or 40-250 nmol/L). VETORYL Capsules may then be re-introduced at a lower dose. Angiotensin-converting enzyme (ACE) inhibitors should be used with caution with VETORYLCapsules, as both drugs have aldosterone-lowering effects which may be additive, impairing the patient's ability to maintain normal electrolytes, blood volume and renal perfusion. Potassium sparing diuretics (e.g. spironolactone) should not be used with VETORYL Capsules, as both drugs have the potential to inhibit aldosterone, increasing the likelihood of hyperkalemia. A small percentage of dogs may develop corticosteroid withdrawal syndrome within 10 days of starting treatment. This phenomenon results from acute withdrawal of circulating glucocorticoids; clinical signs include weakness, lethargy, anorexia, and weight loss. These clinical signs should be differentiated from an early hypoadrenocortical crisis by measurement of serum electrolyte concentrations and performance of an ACTH stimulation test. Corticosteroid withdrawal syndrome should respond to cessation of VETORYL Capsules (duration of discontinuation based on the severity of the clinical signs) and restarting at a lower dose. Mitotane (o,p'-DDD) treatment will reduce adrenal function. Experience in foreign markets suggests that when mitotane therapy is stopped, an interval of at least one month should elapse before the introduction of VETORYL Capsules. It is important to wait for both the recurrence of clinical signs consistent with hyperadrenocorticism, and a post-ACTH cortisol level of >9.1 µg/dL (>250 nmol/L) before treatment with VETORYL Capsules is initiated. Close monitoring of adrenal function is advised, as dogs previously treated with mitotane may be more responsive to the effects of VETORYL Capsules. Owners should be aware that the most common adverse reactions may include: an unexpected decrease in appetite, vomiting, diarrhea, or lethargy and should receive the Client Information Sheet with the prescription. Owners should be informed that control of hyperadrenocorticism should result in resolution of polyphagia, polyuria and polydipsia. Serious adverse reactions associated with this drug can occur without warning and in rare situations result in death (see ADVERSE REACTIONS). Owners should be advised to discontinue VETORYL Capsules and contact their veterinarian immediately if signs of intolerance are observed. Owners should be advised of the importance of periodic follow-up for all dogs during administration of VETORYL Capsules. Store at controlled room temperature 25°C (77°F) with excursions between 15°-30°C (59°-86°F) permitted. 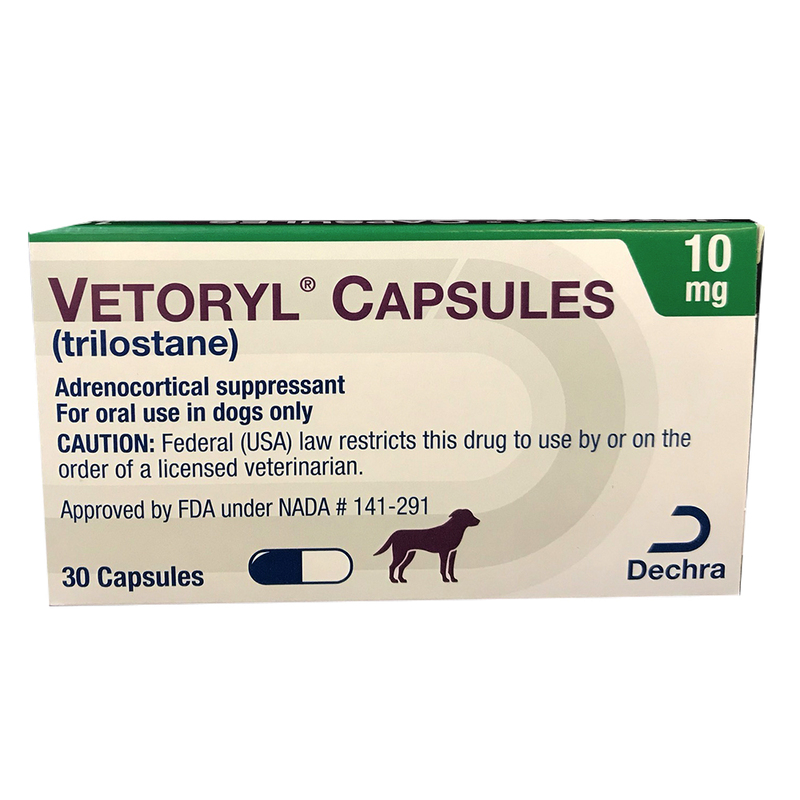 VETORYL Capsules contain an adrenosuppressant drug that is used to treat hyperadrenocorticism in dogs. 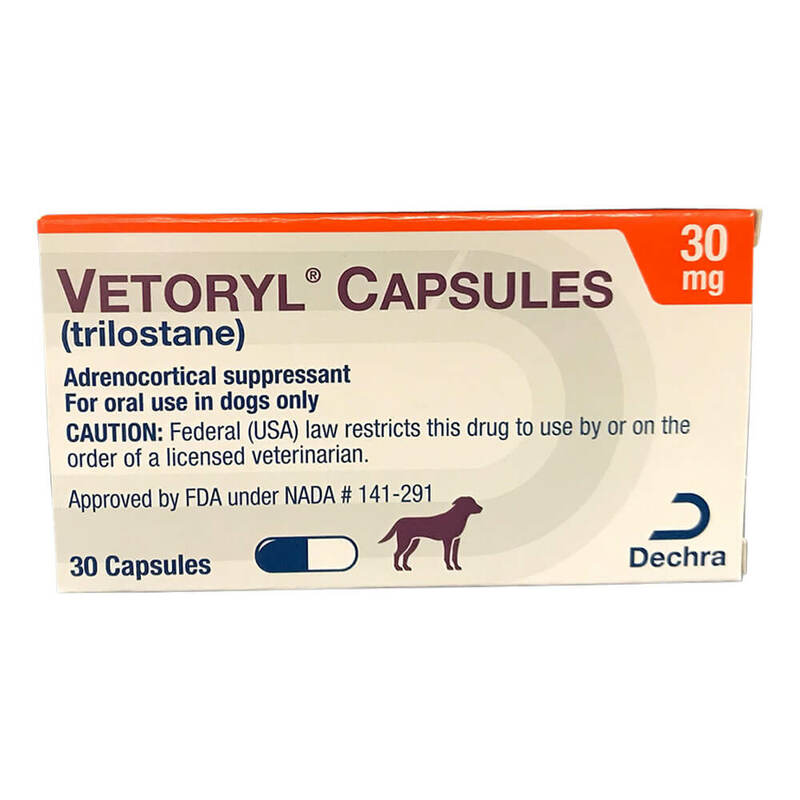 VETORYL Capsules are a prescription drug for dogs. Hyperadrenocorticism (also known as Cushings disease) is a condition in which excess levels of the hormone cortisol are produced. Cortisol is normally released from the adrenal gland into the bloodstream at times of stress. In dogs with hyperadrenocorticism, the level of cortisol produced is excessive and, if left untreated, becomes incapacitating. Your dog may not necessarily display all of these signs. What kind of results can I expect when my dog is on VETORYL Capsules? • Response varies from dog to dog. • Improvement can be seen in most dogs within a few weeks. Which dogs should not take VETORYL Capsules? • Has kidney or liver disease. • Takes certain medications. VETORYL Capsules should be used with caution with several medications used to treat heart disease (some diuretics and ACE inhibitors). 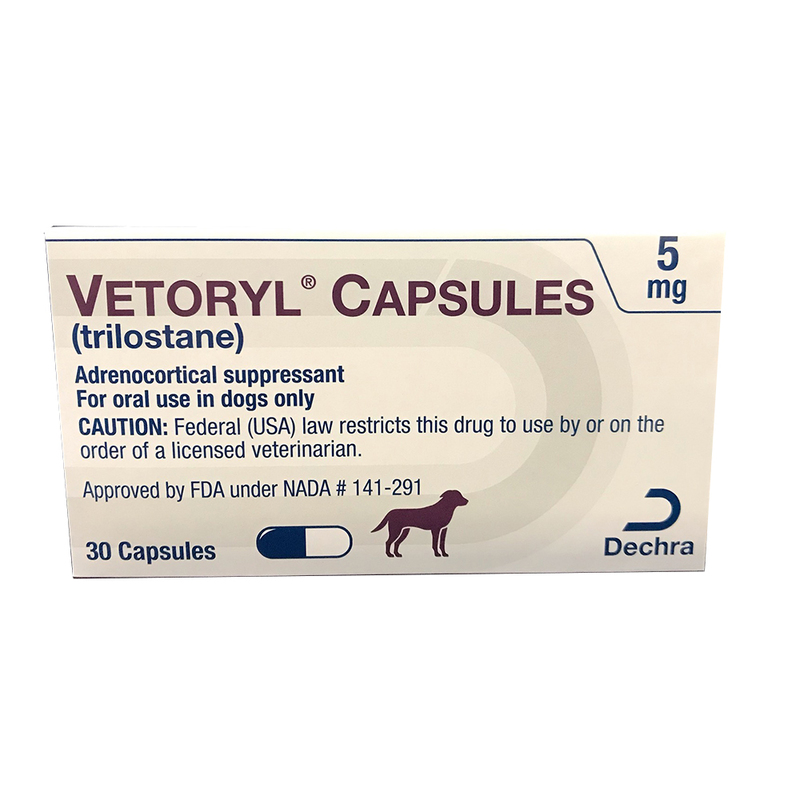 Tell your veterinarian about all medicines you have given your dog in the past, and any medicines that you are planning to give with VETORYL Capsules. This should include other medicines that you can get without a prescription. Your veterinarian may want to check that all of your dog's medicines can be given together. What should I know about giving VETORYL Capsules to my dog? 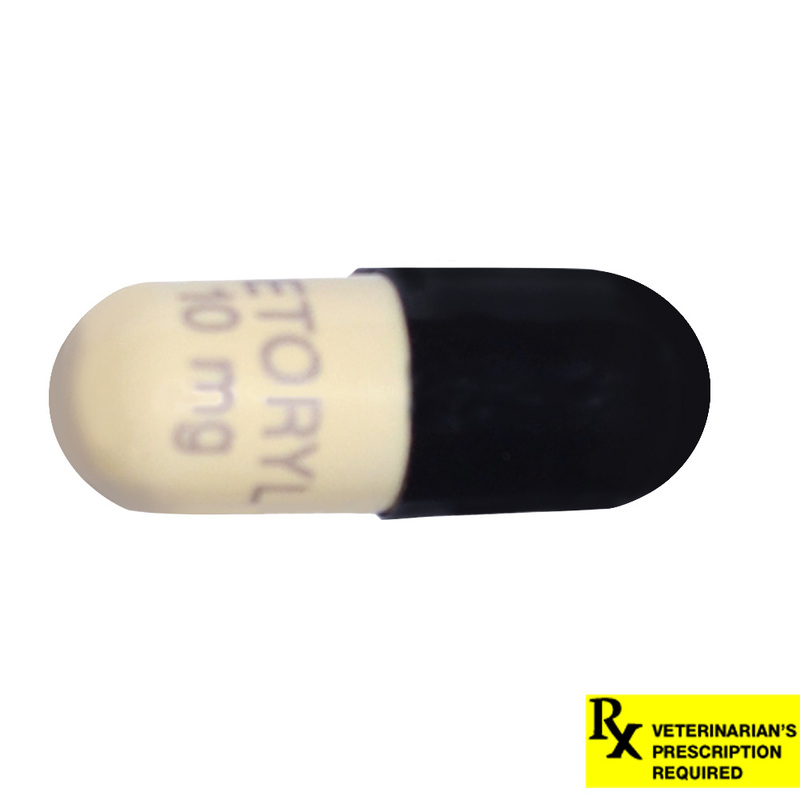 • VETORYL Capsules should be given according to your veterinarians instructions. Your veterinarian will tell you the number of VETORYL Capsules that is right for your dog. Administer capsules with food. Keep out of reach of children. Not for human use. Do not open capsules and do not attempt to split or divide capsules. Wash hands after use. Do not handle the capsules if pregnant or trying to become pregnant. Studies in laboratory animals have produced birth defects and early pregnancy loss. In the event of accidental ingestion/overdose, seek medical advice immediately and take the labeled container with you. Dog Owner Information About What should I talk to my veterinarian about before giving VETORYL Capsules? What tests might be done before VETORYL Capsules are prescribed. The risks and benefits of using VETORYL Capsules. If your dog is pregnant, nursing or if you plan to breed your dog. Any medications your dog is taking, including over-the-counter products and nutritional supplements. What are the possible side effects that may occur in my dog during therapy? VETORYL Capsules, like other drugs, may cause some side effects. Serious, but rare side effects have been reported in dogs taking VETORYL Capsules. Serious side effects can occur with or without warning and, in rare situations, result in death. Depression, lethargy or decrease in activity. Change in bowel movements (such as diarrhea or loose stools). Stops eating or loses all interest in food. As VETORYL Capsules control the hyperadrenocorticism, there should be a decrease in food and water consumption to normal levels. There should also be resolution of excess urination. If, however, there is a dramatic decrease in appetite or the dog stops drinking water, it could be an indication of a side effect requiring treatment. 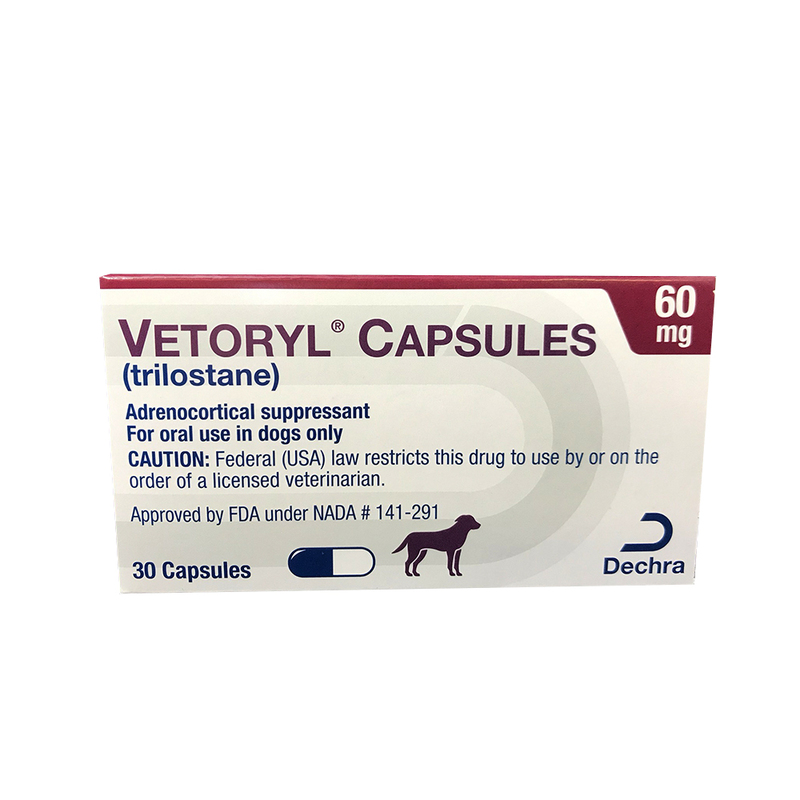 It is important to stop therapy and contact your veterinarian immediately if you think your dog has a medical problem or side effect from VETORYL Capsule therapy. If you have additional questions about possible side effects, talk to your veterinarian. What do I do in case my dog takes more than the prescribed amount of VETORYL Capsules? Contact your veterinarian immediately if your dog takes more than the prescribed amount of VETORYL Capsules. What else should I know about VETORYL Capsules? If you have any questions or concerns about VETORYL Capsules, or hyperadrenocorticism, talk to your veterinarian. 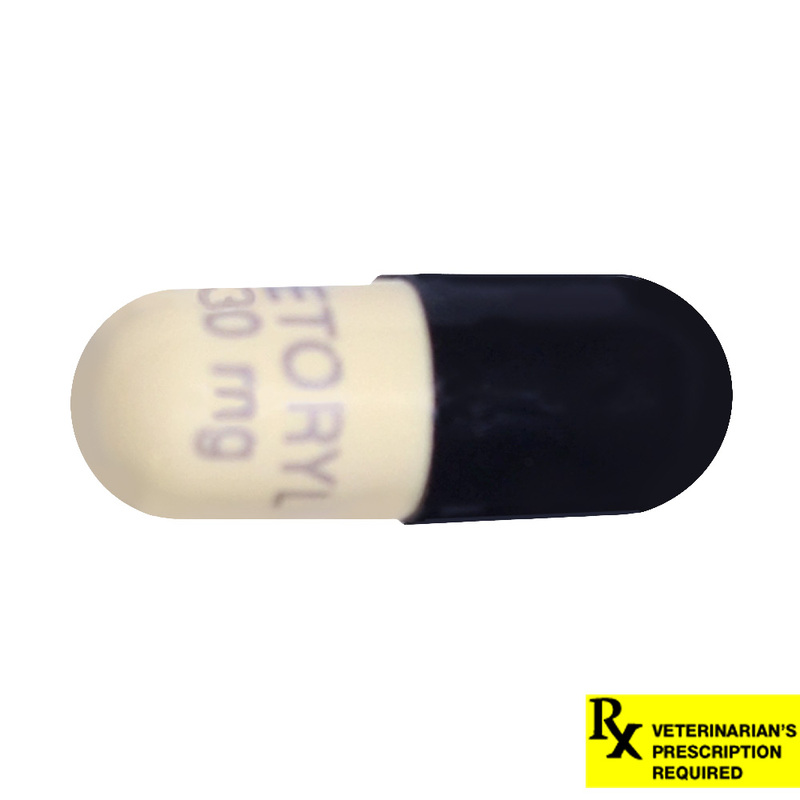 As with all prescribed medicines, VETORYL Capsules should only be given to the dog for which it was prescribed.It is important to periodically discuss your dog's response to VETORYL Capsules at regular checkups. 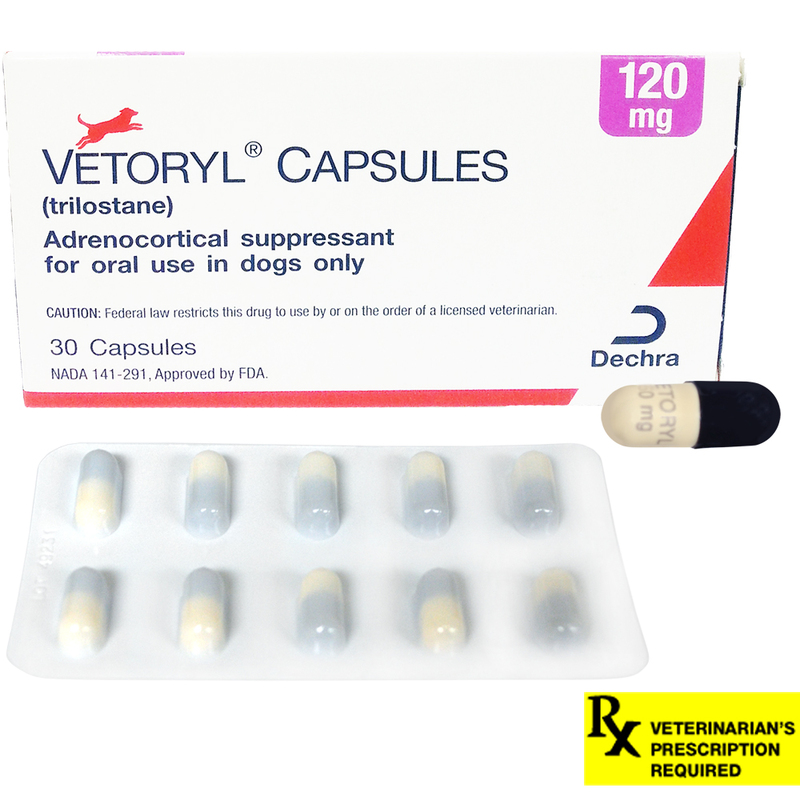 Your veterinarian will determine if your dog is responding as expected and if your dog should continue receiving VETORYL Capsules.